9 photographs : col. ; 10 x 15 cm. 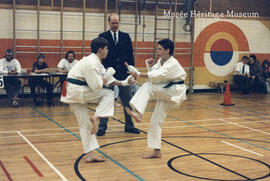 This file consists of photographs from the karate competition at the 1994 Alberta Winter Games in St. Albert. Photographs depict medal presentations, karate competitions, and kata demonstrations at Father Jan school and Bertha Kennedy school. Photographs were taken by Emery Pritchard.